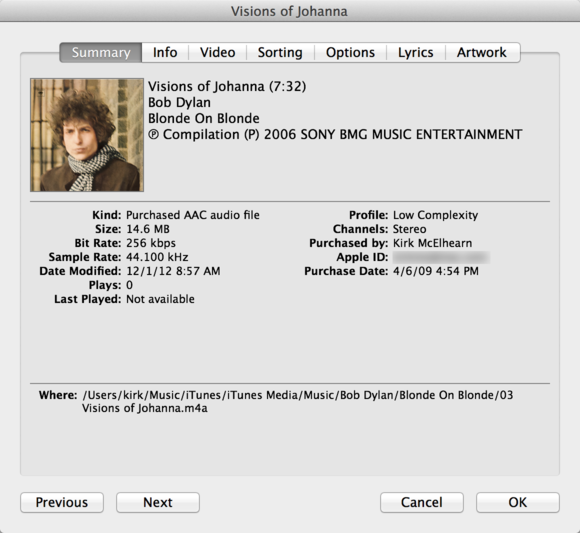 Items in your iTunes library need tags, or bits of information that identify them and help iTunes organize and sort them properly. These tags (aka metadata) tell iTunes what a file is: the type of file (music, movie, ebook, and so on), its name (the first movement of Beethoven’s 5th symphony, The Beatles’ “A Day in the Life”, or an ebook of Henry James’s The Ambassadors), and more. You need these tags to be able to choose what to listen to or watch, and to create smart playlists to listen to music according to preset conditions. 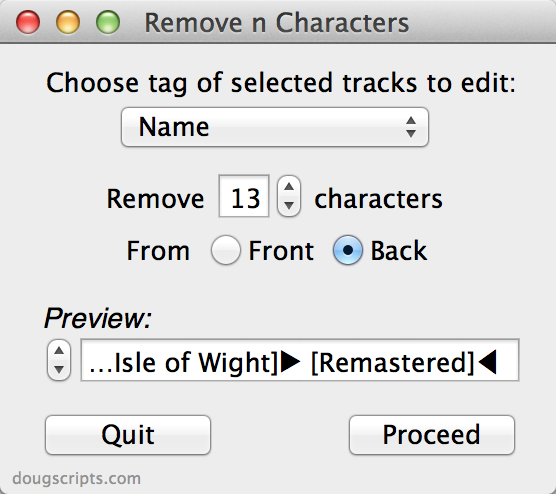 In this article, I’ll explain how to best tag files in iTunes, and I’ll give you some tips to help make tagging more efficient. When you purchase music or other content from iTunes (or other sources, for that matter), it will most likely already be tagged. 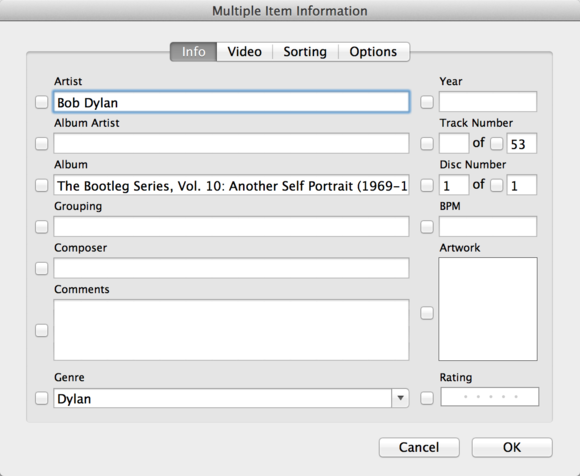 And when you rip your own CDs, iTunes can look for tagging information online and fill in many of the tags for you. But there are times when iTunes can’t find tags for an album, or when downloaded music doesn’t have all the necessary tags. To view and edit tags, you begin by selecting one or more files and then pressing Command-I. The window that displays will be somewhat different for a single file than for a group of files. This window displays when you select a single track and press Command-I. You select a single track when you want to change a tag that only applies to that track. For example, you may want you change the Name (the track name) or the Track Number. Or you may want to change the Album tag for a single track to group it with a different album. To change any tag, just click a field and edit the text, or delete it and type new text. Click OK to save it, or Cancel if you change your mind. Note that there’s no undo option when changing tags: When you click OK, iTunes writes the new tag info to the music file on your Mac. For some tags you edit within the Options tab, this information isn’t stored in the media file, but actually in your iTunes library file. Many tags are optional, but a number of them are quite important and will help you use iTunes more effectively. Name: A track’s name, or the name of a movie, TV episode, or book. Artist: A band, or singer, or ensemble who performs the music; an author, for a book; a director, or actors, for a video. Album: The name of the album. Track number: For tracks to play sequentially, you need to have the proper track numbers. Genre: To be able to use smart playlists, you should fill the Genre tag. Compilation: This tag, within the Options tab, is important if your CD is a compilation. It can be a little tricky, and I wrote an entire article just about compilations. You can fill in many of the other tags as well. If you have classical music, you’ll want to enter names in the Composer tag. You may want comments, such as “Live album,” or “Demos,” depending on what type of music you have; you can use smart playlists to look for these. You can also use the Comment field as a sort of catchall tag, in which you can insert multiple genres for tracks or other notes on which to build smart playlists. And if you like to read song lyrics, on your Mac or your iOS device, you can enter them in the Lyrics tag. Finally, while it’s not technically a tag, the Artwork field is where you put album art to make your music prettier. As you can see, there are a number of tabs in the window shown earlier. Each one lets you view or edit different tags. The Summary tab gives you an overview of the track’s info. The Info tab lets you change the main tags: Name, Artist, Album, and so on. Video lets you edit tags for movies and TV shows. 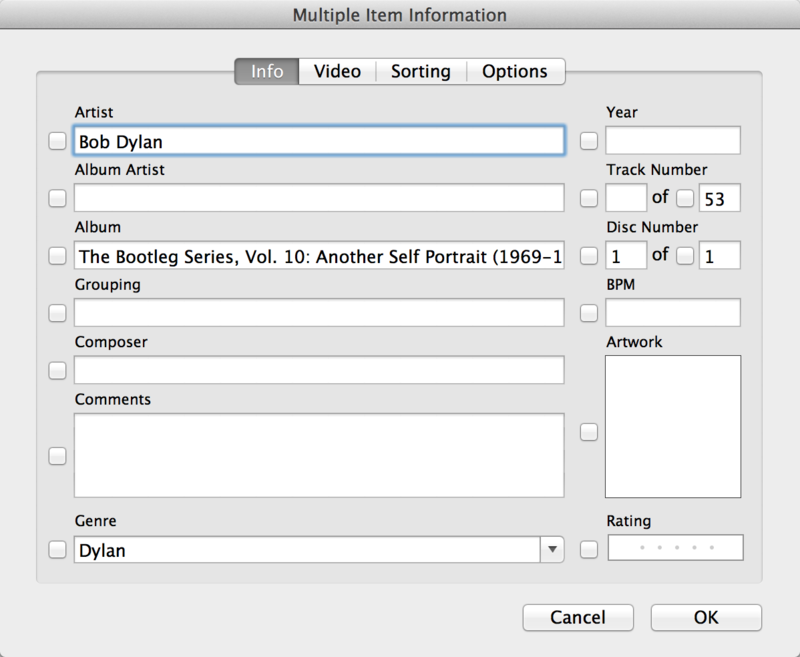 Sorting lets you change sorting options, such as whether an album by Bob Dylan shows up under B (for Bob) or D (for Dylan). The Options tab lets you adjust a number of settings about a track, such as an equalizer preset, media kind, or rating. You can paste the words to your favorite songs to the Lyrics tab. And you can add album art to the Artwork tab. The Summary tab gives you an overview of some of the tags attached to a file. If you do a lot of tagging, keyboard shortcuts can help speed the process. You can view each of the tabs at the top of the info window by pressing the Command key and a number: Command-1 is the first tab, Summary; Command-2, the second tab; and so on. You can skip through tracks when you’re viewing the single-track info window by clicking the Previous or Next button at the bottom of the window. But from the keyboard, you can do the same thing by pressing Command-P or Command-N. When you select multiple tracks, the window you see is different. 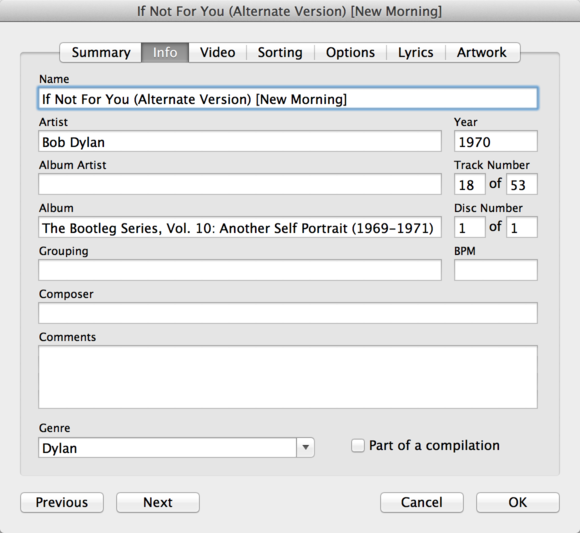 It has only four tabs, and you can only edit information that is shared by a group of tracks. So you can’t change the name or lyrics for multiple tracks, and you can’t change ratings on the Options tab. The Multiple Item Information window is a bit different. 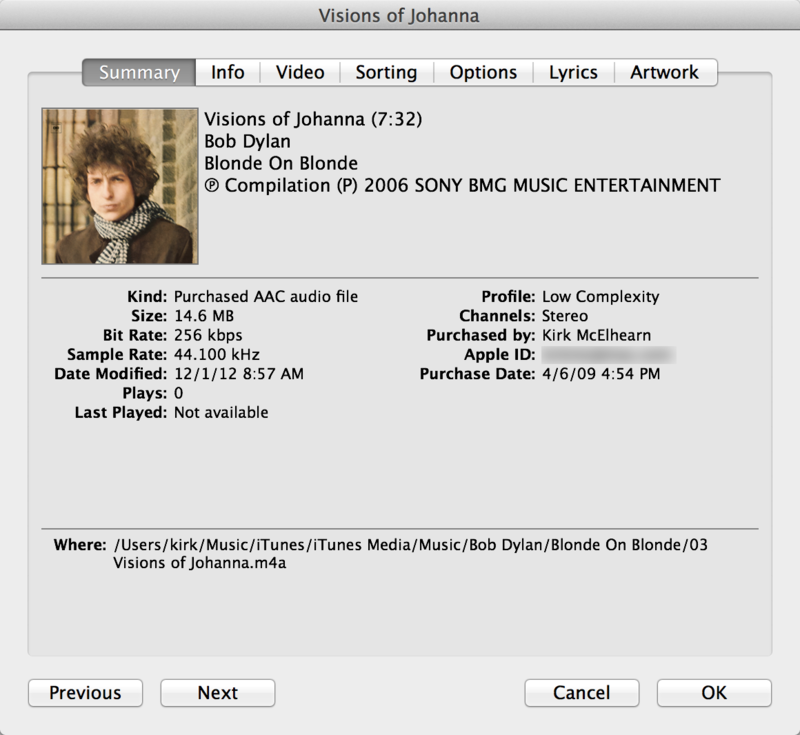 This Multiple Item Information window is the one you use when you’ve selected, say, all the tracks of an album, and want to edit the title, artist, or genre. Speaking of genres, you may not know that you can use any genre you want—you’re not limited to the ones in iTunes’ pop-up menu. In the above examples, you can see that my Bob Dylan music is in the Dylan genre. Because I have all of his albums, I’d rather have them in a separate genre. Search-Replace Tag Text lets you find and replace text in any tags. For example, you may have a groups of albums with the word Remastered at the end of each track’s name. If you want to replace it with, say, Remastered 2013, this script can make that change. 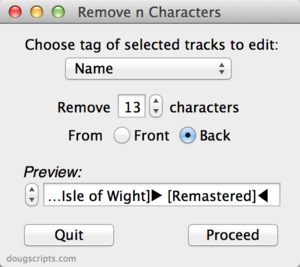 Quickly remove extraneous words in tags with this cool AppleScript. Remove n Characters from Front or Back. Let’s say you want to get rid of the word Remastered after those same tracks. You can easily delete the characters, or any others, by selecting the number of characters the word uses. This works with Track, Artist, Album, Comment, Composer or Show tags. I use this script often to clean up classical music. This Tag That Tag. This script lets you copy information from one tag and paste it, or append it, in another tag. Albumize Selection. When you have an album that doesn’t have track numbers, this script will add them in the form “1 of 10.” It’s much easier than manually numbering each track. Doug’s site has plenty more AppleScripts. Have a browse through the Managing Track Info section for scripts that work with tags, or look at the entire site for other scripts that can help work with iTunes.